One of our goals as a car club is to help support local Groups & Charities. We thank all car enthusiasts who come out to our car shows and help us raise funds for these very worthy causes. Therapeutic Riding is widely accepted as a beneficial method of improving the physical and/or mental well-being of riders with a wide range of disabilities. Riding provides an opportunity for invigorating exercise and recreation, and it gives the rider a sense of achievement and self-worth. 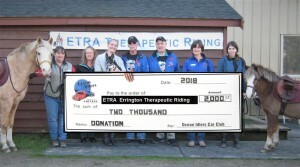 ETRA’s Instructors are fully certified by the Canadian Equestrian Federation and the Canadian Therapeutic Riding Association and hold current First Aid Certificates. Jumpstart is dedicated to removing financial barriers so kids (ages 4 to 18) in our community have the opportunity to participate in sports and physical activity. They assist with the costs associated with registration, equipment and/or transportation. 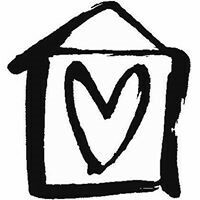 Haven Society’s mission is to promote the integrity and safety of women, children, youth and families and the development of a respectful and healthy community. As a leading anti-violence organization operating from feminist principles, Haven Society will achieve this mission by providing a range of services, public education and advocacy in the Oceanside area. A group of highly-skilled professional volunteers trained to standards set by Emergency Management BC (EMBC). 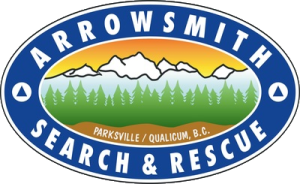 Assist RCMP & local authorities in searching for people missing or individuals in distress. 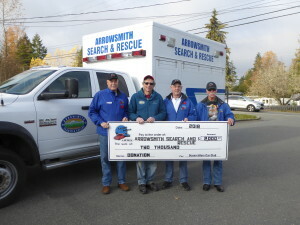 They respond to local calls and assist other SAR groups throughout BC. The main area of operation runs the length of the coastline from Nanoose to Cook Creek, as far inland as Mt. Arrowsmith. Including the Jedidiah and Lasqueti Islands. 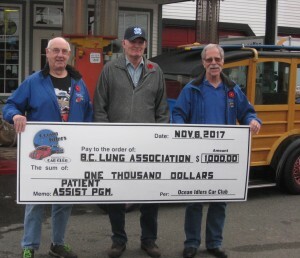 BC Lung Association receives a $1,000. 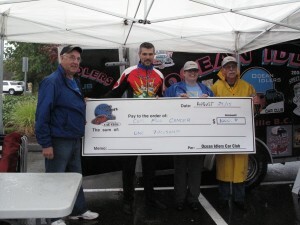 donation from Ocean Idlers Car Club for the BC Lung Patient Assist Program. 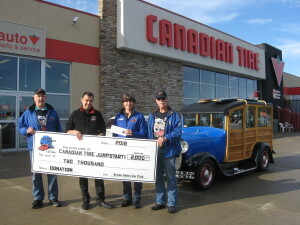 Car Club donates $1,000. to the Nanaimo Hospital Foundation towards the purchase of medical equipment for the Oceanside Healthcare facility located in Parksville. Presenting $1,000. 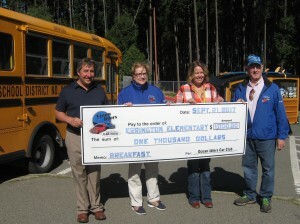 Club Donation to the Errington Elementary School for their Breakfast Program. (L to R) Brian Worthen, Errington Elementary School VP, Mireille Marquis, Ocean Idlers VP, Maleah Carlson, School Child & Youth Care Worker and Fred Imrie, Ocean Idlers Treasurer. The Breakfast Program is a school-run program to meet the needs of the 300+ students in grades K-7 at Errington Elementary. Many studies have shown that good nutrition is just as important to a child’s learning as the quality of their education. This school is doing everything it can to ensure that all students are well fed and ready to learn at their maximum potential. Ocean Idlers Car Club contributes $500.00 to Errington Elementary School Coding & Robotics Project. The allocated funds will be used to purchase robotics equipment. According to Terry Graff, their teacher, the goal is to teach students (Grades 5 – 7) in a diverse classroom to code and use robotics, this will have a positive impact on student engagement and learning across the curriculum. Improving sensory learning, problem solving, collaboration, and communication skills and providing opportunities for hands-on-innovations will be the focus. Through this initiative, the students will be able to practice real world applications of coding by “playing” with robots; writing code to control their actions and movements using both Lego Mindstorm EV3 Robots and Edison Robots. 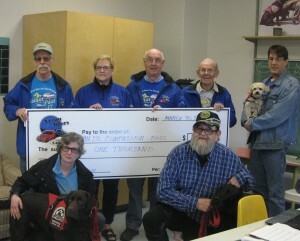 Executive members of the Ocean Idlers Car Club present a $1000 cheque to Vancouver Island Compassion Dogs, Barbara Ashmead, President and three veterans with their dogs. The non-profit organization adopts suitable rescue dogs from various shelters for this program. The unique comprehensive training program matches rescue dogs to veterans with Post-Traumatic Stress Disorder (PTSD). VICD is a Registered Canadian Charity, donations to their program covers the training costs, veterinary care, transportation, dog food and supplies. Fred Imrie, Treasurer of Ocean Idlers. The ALS Society of BC is dedicated to providing direct support to ALS patients, along with their families and caregivers, to ensure the best quality of life possible while living with Amyotropic Lateral Sclerosis ALS. Another presentation of $1000 to Tour de Rock – COPS for Cancer when law enforcement and emergency services personnel cycle to raise funds that allow the Canadian Cancer Society to fund life-saving research and caring support programs to reduce childhood cancer. 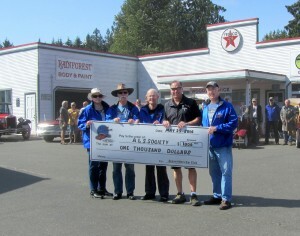 Our car club in partnership with other local vendors hosted a car show for the previous years and have donated over $10,000 for the past four years. Unfortunately circumstances have caused this event to be cancelled for 2016. 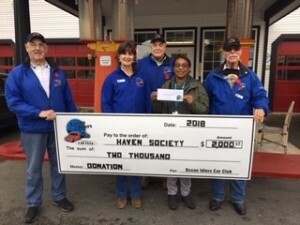 Our ongoing donations include sponsoring university and school bursaries, donating money to the Salvation Army, The Society of Organized Services, Cops For Cancer, Parkinson Society, Royal Canadian Legion Poppy Drive, Children’s Health Foundation of Vancouver Island, Jeneece Place and the RCMP Victim Services in Parksville. 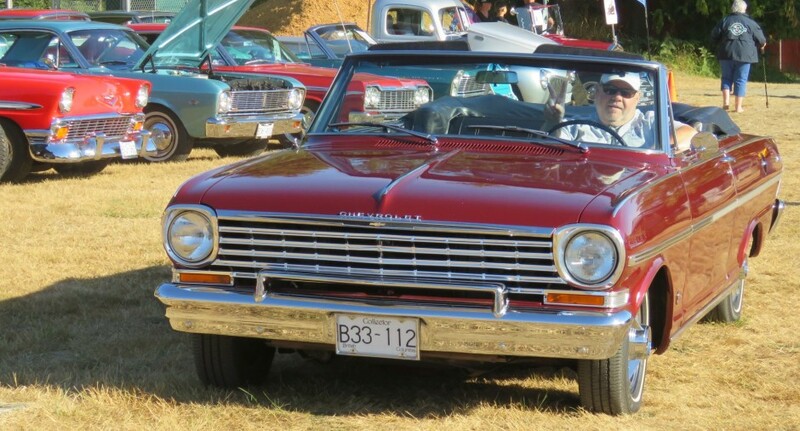 We also joined in civic parades, Lee Harrison Auto Events, and the Specialty Vehicle Association.